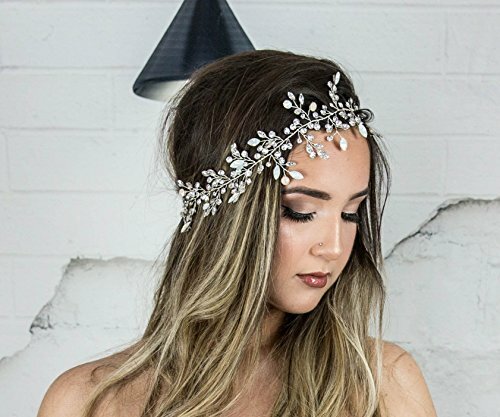 The Day Dream Hair Vine is one of our favorite designs from our 2018 Bohemian Royal Collection. DETAILS: The Day Dream Hair Vine is really such a dreamy statement piece. This hair vine is made on a silver base with clear navatte Swarovski tones, White Opal/small tint of blue navatte Swarovski stones and a few light pastel pink round Swarovski stones scattered throughout. I add the colored stones to give the piece more depth and detail. If you want to add a certain color stones to the piece, send me a message and we can customize it! HANDMADE: Each stone is delicately placed on this headpiece so there is a lot of love that goes into its creation! STYLING: This piece can be worn in the back of the head, as a headband, along the forehead or wrapped around a up-do. The possibilities really are endless. This piece comes with a satin ribbon tie. If you want to wear the headpiece along the back of the head we recommend removing the ribbon and simply attaching the headpiece with bobby pins. The headpiece has loops on each end which is perfect to secure the piece. If you have any questions about this product by Hair Floaters, contact us by completing and submitting the form below. If you are looking for a specif part number, please include it with your message.